This is the original review from when I first read Uncle Tom's Cabin, way back in 2006. Since then I've read it several more times, even going so far as to narrate it with commentary on my Forgotten Classics podcast. I'm a little more than halfway through yet another time and have been struck anew by how many psychological types Stowe worked into this exciting cliffhanger. It is also my current inspirational reading as you are never going to get more discussion of Christianity in a novel than in this one. As always, I want to share something that's brought me so much pleasure, so I'm rerunning my original review below. I never knew that it was such a page turner! About halfway through the pace picked up so that I was avidly reading whenever I had a chance to see if George and Eliza would shake off their trackers, Uncle Tom would make it back to his family, what it would take to make Topsy reform and much more. How about that crazy Cassy, hmm? And poor Emmaline ... would someone save her before Simon Legree got his filthy hands on her? Wow! I never knew that Uncle Tom actually was a Christ-figure, a living saint. No wonder he is misunderstood by so many. They are not getting the whole picture. I never knew that so many sorts of people were represented throughout the book. The language can be rather stilted due to the style of the times but Stowe did a good job showing many different attitudes toward slavery and how people excused themselves under the flimsiest of excuses. One expects the broadly painted very good and very evil owners but not the more shaded in-between characters. It was fascinating toward the end of the book to see where many of the slaves wound up. One could discern what Stowe's ideas of a solution for the slavery problem were and, indeed, it was even more interesting to read her afterward where she discusses it specifically. 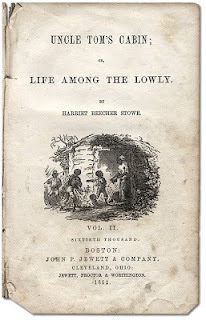 I thought that Stowe included herself in the book as the maiden aunt from New England who thought she understood the problem until she came up against Topsy who demanded that she put her whole heart and soul into realizing that the slaves were real people. Rose saw her as Mrs. Shelby, the kindly wife of Uncle Tom's original owner, who as soon as she got a chance absolutely did the right thing. I am quite grateful that Rose read this book and pushed it on me. Highly recommended.